Are you looking for a tent but don’t want to deal with the hassle of having to set one up? Then an instant tent may be the perfect solution. Instant tents combine the functionality and protection of a traditional tent but with the added convenience of being able to be set up quickly. In this ultimate review, we will go over the best instant tents. We have spent over 150 hours testing various instant tents to come up with our top picks. Check out the table below for our 5 best instant tents. And if you want to read our full review of a particular model, just scroll on below! There are a lot of tents out there to choose from. To make things easier on you, we have broken down many of the top brands into specific sections. You can read a brief overview of each brand below. To see our full review of that particular brand, simply click on the link and you will be sent directly to it. Abco Tech is one of the lower-end brands that we are testing. They have a small selection of affordable but simple instant tents. These tents are designed for 1 or 2 people and don’t have a lot in the way of features or improvements in overall build quality. 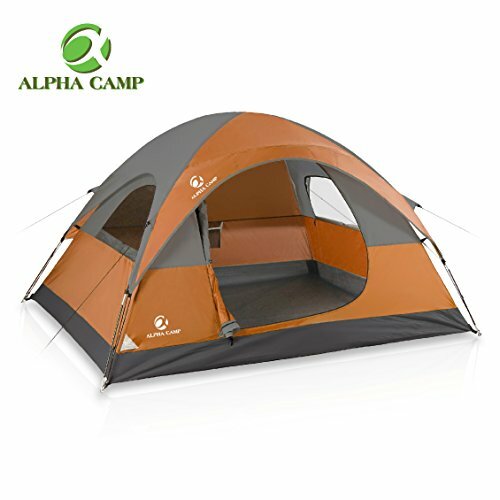 Alpha Camp is a part of AlphaMart’s which specializes in a host of outdoor products including patio furniture, camping gear, and homegoods. Their tent selection is comprised of around a dozen models that include a couple instant tents (in 6 and 8 person configurations. 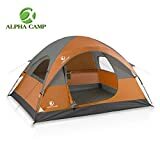 Asking prices are quite reasonable given the size of Alpha Camp’s Instant Tents but this does, of course, impact quality some. Alvantor is one of the few brands that focuses almost completely on tents. However, more specifically, they focus on lower-cost tents that are designed to fit in any budget. They also have multiple tents for kids but that isn’t what we will be discussing today. Instead, we will be trying out their lineup of instant tents. They actually have a pretty good selection including 1 to 2 person tents, 3 to 4 person tents, instant canopies, and more. Americ Empire’s approach revolves around high-quality products for the outdoor family. And within this product category are a series of tents. While most of Americ Empire’s tents don’t have the instant set up capabilities, their largest model, a 12 to 13 person tent, actually does. 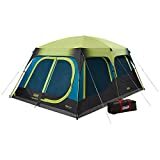 This makes it easily stand out from most of the other brands that we have reviewed since they mostly sell smaller instant tents. But with such a large and capable tent, the asking price, of course, goes up. Ayamaya might have a funny name but they have a pretty big footprint in the online outdoor gear world. Their selection of camping tents is pretty large and also includes a handful of instant tents. Specifically, you will find that they offer both 3 to 4 person tents and a larger 4 to 6 person tent. Asking prices are a bit higher than you may see from other brands but that does come with a step up in features. Bend River is a bit different than most other brands that we have reviewed in that they focus primarily on outdoor tents for kids and babies. In fact, they are one of the few brands that actually sell a baby tent. Since these tents are designed for kids and children, they are on the small side. But this does mean that they fill a very unique niche and that the asking prices are quite reasonable since not as much fabric is necessary. Bushnell is one of the more established companies that are making instant tents in our review. This brand is large enough that they are even carried by juggernauts such as Walmart. While they focus on a large range of outdoor products (many of which are centered around hunting), they also have a small lineup of larger sized tents. Only two of their tents could really be considered “instant” tents so we will be focusing on those models. Coleman is probably one of the most familiar brands that we have tested. And their lineup of instant tents is among the vastest that you will find anywhere. Sizes range from small 2-person tents all the way up to their huge 10-person instant cabin tents. Prices are a bit higher than many brands but you do get the Coleman reputation and experience with the purchase. Core makes various items including tents, lights, chairs, sleeping bags, and more. All of their products take a similar design approach and overall aesthetic. They have a very nice selection of instant tents that range in size from a 3-person dome all the way up to a huge 12 person instant tent. And they have some really clever features that help them stand out from the crowd. Easthills Outdoors is another brand with a decent online presence. They specialize in beach gear and camping equipment. They are unique in that they have instant tents and instant shelters designed for either camping or for the beach. And depending on which model you go with, you will find unique features and building aspects that optimize that particular product for those conditions. EasyGO really is all over the board when it comes to the products they sell. They have dipped their fingers in just about every category that you can think of! As for their instant tents, they have a small but diverse selection of low-cost options. 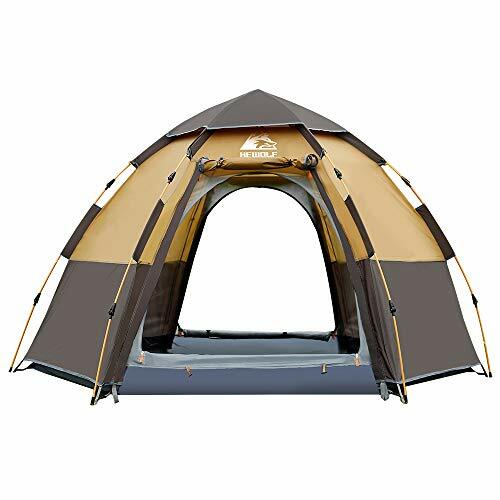 One way that they do stand out is that they have expanded form a typical instant camping tent to including instant bug shield, instant spray tan housings, and more. Hewolf has quite a few tent options but their instant tent or quick tent selection is limited to a small number. And all of their instant tents are on the smaller side, being designed to sleep 1 to 4 people. But their asking prices are very fair and we really like the fun coloring of them. Lightspeed Outdoors is in the business of being fast. As their name suggests, they specialize in tents that are designed to be set up and taken down extremely quickly. Their other unique quality is that the vast majority of their tents aren’t really designed to be fully enclosed tents. Rather, they are more like canopies or cabanas. Those aren’t the focus of this review but they do have a Mammoth 4 person tent and a kid’s fort that are designed more like traditional tents. Night Cat brings to this review 2 rather capable instant tents. They offer a smaller 2-3 person tent and the much larger 4-6 person tent. Both tents share the same brand name but differ greatly beyond that point. 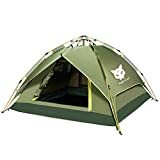 You will certainly find some unique features and overall design aspects with Night Cat Instant Tents that you won’t find in a lot of other brands. And the asking prices are pretty reasonable, too. Many of you are likely familiar with Ozark Trail through their popular lineup of coolers. They are a mainstay at Walmart and other brick and mortar stores. But they also have a big following online. And for good reason: their selection is enormous! They have one of the largest selections of instant tents of any company that we have come across. And with such a large selection, they are able to meet the needs of a wide variety of people. You can pick between low-cost options that are only big enough to sleep 2 people and this scales up to enormous instant tents that are large enough to sleep 15 people. Sportneer has a small selection of products that focus on the cycling, camping, and exercise niches. As for their instant tents, they have a single model: a 3 to 4 person instant tent. 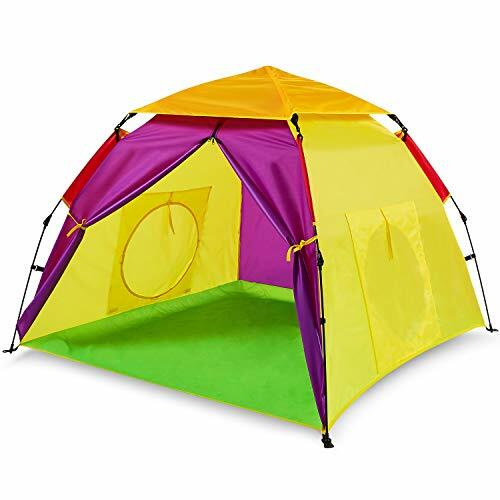 This tent is extremely affordable and simple to use. But the low cost does come at the expense of size and features. Teton Sports is a higher-caliber company than many others on this ultimate guide. Their products are designed for more extreme conditions and are constructed accordingly. As you might expect, this also bumps up the cost some. While they do have quite a few tents to choose from, they really only have one that we would consider an instant tent or pop up tent. And it is unique in that it is designed for just one person to use. Timber Ridge is sold at quite a few brick and mortar stores in addition to online marketplaces such as Amazon. They have a nice selection of tents (many quite large) but their instant tents are filtered down to just two: The Greenstone Ridge and the Granite Canyon. Both tents follow a very similar design approach with the main difference being in how many people they can sleep. The Greenstone Ridge sleeps 4 and the Granite Canyon sleeps 6. Toogh is a company that we did not know much about before this ultimate guide. But we quickly learned that they are a pretty popular brand online when it comes to low-cost tents. They offer two different tent sizes: a 2 to 3 person instant tent and a 3 to 4 person instant tent. And both tents follow a very similar design approach. Qwest is sold in many physical stores including Target, Wal-Mart, etc. They are also sold online. And their simple and low-cost pop-up tent is gaining in popularity. However, at this price point, you do have to sacrifice quite a bit and this comes in the way of features and build quality. 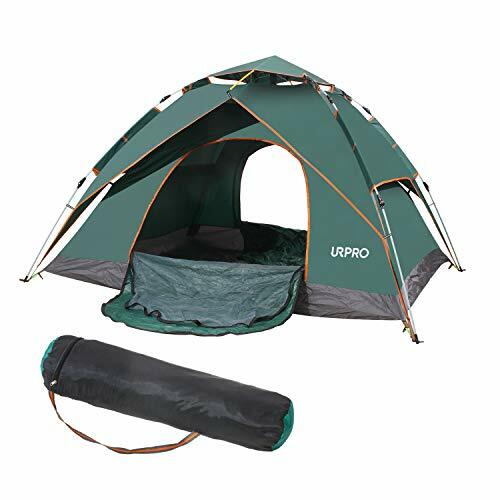 URPRO has some of the lowest cost pop-up tents that we have seen. And that is a big reason for their popularity online. However, as you might expect, with big cost savings comes questions about the build quality and life expectancy of these tents. Not to mention that both available models are quite small, coming in at 2 people and 3 to 4 people. Wantdo is very eclectic in what they sell. You will find their products ranging from camping gear, ski equipment, and even fashion. But we will be focusing on their small lineup of mobile and low-cost instant tents. You can choose between two models: a 2 person tent and a 2-3 person tent. Yes, that is how you spell their name! Wnnideo might have a funny name, but they are already making a splash in the outdoor camping world. They are a newer company but already offer a pretty decent selection of instant tents. And their tents are mostly on the larger side and even offer amenities such as multiple rooms! Xinqiu has one of the smallest selections of products that we have come across. In fact, they only have two items that we have seen. 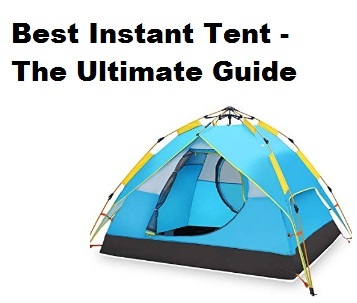 And only one of those items really falls under the topic of this ultimate guide: instant tent. Their affordable instant tent is on the smaller side but promises quick and easy installation and no fuss transport. Zepnh is a small company that appears to import a few different smaller instant tents. Most of their models seem to be focused on 2-person instant tents. And they tend to fall in the mid price range. But for paying a bit more, you will find that the quality is also bumped up a notch. There are several factors that go into finding the best instant tent to meet your needs. After consulting with various experts (as well as doing our own in-house testing) we came up with a small list of metrics that we feel most people consider when shopping for a new tent. We discuss each metric in detail below. Build quality has everything to do with the durability and longevity of the instant tent. This includes all components of the tent: the outer fabric, the internal fabric, the frame, the stitching, and overall fit/finish, etc. All of these play a part in not only how long a particular tent will last but also what type of environment that you can put it in. The most common material that brands used for the outside of their tents is some sort of polyester. But within these are dozens of different types of polyester. As for the frame, you will find most people use fiberglass. But there are some other brands that opt for metals like aluminum and steel. We decided to group features and ease of use into one category since they are very intertwined. As the name suggests, features refer to what and how many features a particular pop up tent has. Common features can include multiple entries/exist, ventilation systems, internal storage pockets, routes for running electrical cords, hooks to hang lights, overhead awnings, and more. Ease of use refers to how easy the tent is to set up, take down, and transport. Despite being called “instant”, not all instant tents are actually like that. Some may take much longer to set up than others. And we also factor in how difficult they are to transport. While not as important to many, styling is still something that we figured we would discuss. We like to see tents that have an updated style, that have multiple color choices, and that actually appears to be made of quality components. Price is pretty self-explanatory. It is how much the item costs! But just because a particular model is cheaper than another doesn’t mean that it will automatically score a better rating here. Rather, we try to look at the big picture and compare that model to other similar models on the market. Obviously, a 10 person tent will probably cost more than a 2 person tent. But if the 2 person tent has some major issues while the 10 person excels, then the more expensive 10 person tent may actually score better in the price category. Overall Rating summarizes up all of the other metrics into an aggregate rating. This helps to give you a “big picture” look at how well that particular instant tent scores. As a rule of thumb, a 3.5-star rating or above is a good buy, a 4-star rating or above is a great buy, and a 4.5 or 5-star rating is a fantastic buy. These are our full reviews of the best instant tents. We break down the metrics discussed above in detail and also assign a rating to each metric. We are a bit underwhelmed by the build quality of the Abco Tech Instant Tents. The zippers are very sketchy and notorious for derailing. In addition, the Velcro that holds the flaps down don’t do a very good job of it: wind or any sudden movement tends to undo them. Furthermore, the fabric is pretty thin and prone to tearing. If you accidentally brush the fabric up against a sharp surface, there is a good chance that it will end up tearing a hole in it. There aren’t a ton of features here either. There are double doors in the larger model which is nice. And the thin fabric (which is a definite negative when it comes to build quality) does make it so that the tent breathes very easily. This will be helpful in muggy or hot situations where you are trying to take advantage of the wind to cool things off. As for their pop up potty tent, it will come with thicker fabric that is opaque for added privacy. And in their 2 person tents, the doors have an inner zippered screen that can be opened and closed to provide increased breathability when you want it and more privacy when you need it instead. These are low-cost tents and the styling reflects that. There are two colors to choose from in the 2-person model: blue and red. 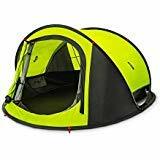 And the pop up bathroom tent comes in just a lime green color. But the overall fit and finish leave a lot to be desired. At a quick glance, you won’t confuse these with multi-hundred dollar instant tents from higher-end brands. The biggest selling point of the Abco Tech Pop-up tent is its asking price. It is very affordable and among the cheapest products you will find anywhere. And for a few casual trips to the campsite, they should work alright. However, if you plan on repeatedly using this model, don’t be surprised if things start to break. But for the asking price, that is to be expected. The Abco Tech Instant Tent is a decent entry-level model for those on a tight budget or simply looking for a small tent for a handful of camping trips at the most. 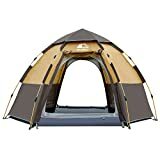 If you plan to put this tent through demanding outdoor adventures, its lackluster build quality and limited features will definitely be noticed. It is also lacking in sleeping/standing space so larger individuals may find using it to be quite uncomfortable. Build quality, considering the price, isn’t terrible. The main issues that we have revolve around the fabric at the base and sides of these tents. There have been several reports of them arriving with tears already in them upon taking them out of the package. However, assuming that you don’t have to deal with any initial tears, the fabric is surprisingly resilient to typical wear and tear that you will find outdoors. As you might expect, this particular model also isn’t fully waterproof (despite what the advertisements may lead you to believe). However, this can be remedied by spraying a water sealant on the fabric. But this will sacrifice the breathability some. The floor is much more water resistant and should keep out water in all but the wettest conditions. This tent is incredibly simple to set up (which is what you should expect in any instant tent). Total set up time is around 1 minute. The spring system in place is easy to use and extend and you and one other person should be able to take care of it. In a pinch, it can also be done by a single person but it may take a bit longer. For storage, you will find two large side pockets that are great for stowing away items while not in use. There is also a handy cable port that will allow you to run an electric cord through (for those of you who prefer to keep a piece of civilization while camping). As for windows, there are 6 in total with the two largest ones have a removable flap. 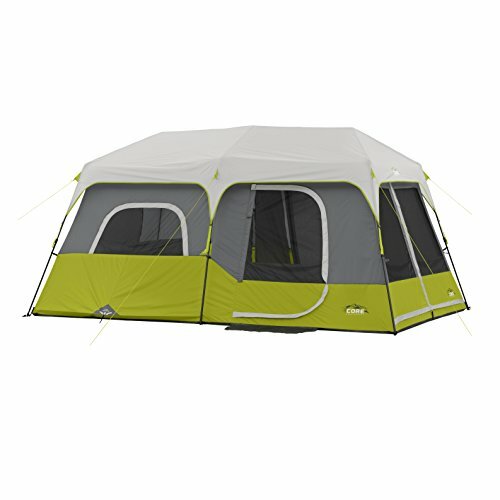 Two upper mesh windows give the tent a “second story” type of feel which is really cool! When you want extra privacy, simply fold the flaps up. And during the day when you are after more breathability, let the flaps down to help with airflow. Finally, the tent ropes come in a reflective coating to make them much easier to see at night. For both the 6 and 8 person models, you will have two colors to pick from: orange and blue. Both colors look nice but we always would prefer a few more color choices (and a camouflage option would have been nice as well). The overall styling of the Alpha Camp Instant Tent is pretty good. It has a progressive and modern look that quickly differentiates it from your grandpa’s old tent. And the default color combination of orange/blue and grays appeals to just about everybody that we have asked. The asking price for the Alpha Camp tents falls about the middle of the road. And considering the acceptable build quality and a nice lineup of features, this is at a good price point. There are some cheaper models out there (even in the 8 person size) but you will be sacrificing too much in the way of durability and features with most of those. Alpha Camp brings to the table a couple of nice 6 and 8 person instant tents that meet the mark in most regards. Assuming that you don’t have to deal with torn walls from the get-go, you will find that these tents should last for a few seasons without major issues. And the features that they bring to the table are plentiful. These are a strong buy in our book. Despite being a low-cost option, the overall build quality is quite good. The fabric is coated with a high PU coating material that also has waterproof seals. This means that these tents are quite water resistant (although not fully waterproof). The framing is plastic but is still strong enough to hold up to typical wind conditions (but won’t be quite as tough as metal). The various hardware pieces are of equivalent nice quality and should handle multiple seasons of use. Probably our favorite aspect of Alvantor instant tents is just how lightweight and compact they are. Depending on which model you go with, they can weigh anywhere from 2 to 4 pounds. At that weight, you can easily throw it inside your backpack without having to deal with much extra strain. In addition, they fold up into an incredibly small size when not in use. This makes finding storage for them a breeze. As for features that you will enjoy when it is set up, what is available is pretty standard and will vary depending on which specific model you go with. The smaller canopy models won’t offer much as their real intention is to be a makeshift bit of protection from the elements. The larger models will expand on this and include flaps that can be opened and closed for ventilation, an overhead flap that protects you from rain when opening, a shoe mat, an e-port (for running electric cords through), a hook for a lamp, and more. The larger models are also big enough to comfortably sleep tall people. Our major gripe with the styling of Alvantor tents is in the color choices. For whatever reason, they seem to stick primarily with blues and teals. If you are someone that doesn’t enjoy these colors, you may be hard-pressed to find a model that works for you. However, what we do like about this brand is that each type of tent that they offer varies greatly in its styling. The 3 and 4 person tents aren’t simply slightly larger versions of their single and double tents. Instead, they are completely redesigned. And the overall design of these tents is modern and well thought out. When considering the build quality and features available (particularly in the larger tents), the asking price is more than fair. You get a lot of tent for not a lot of money. While there are a handful of cheaper tent brands on the market, few will be able to match Alvantor when it comes to quality and selection. Alvantor is one of the more popular tent brands online and now we know why. They have a very nice selection of instant tents that should accommodate single campers all the way up to small families. 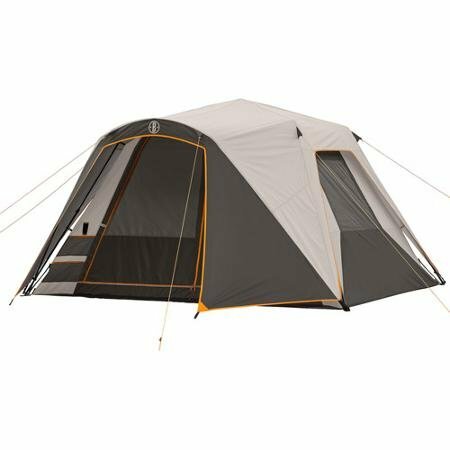 While their smaller tents are a bit limited in features, their largest models offer up quite a few. And all sizes and shapes are well-made. Add in that they are reasonably priced and you have a strong buy in our book. The build quality of Americ Empire’s large instant tent is quite good The construction is proudly performed in the USA so you know that they are not skimping on quality. The liner is made of 100% waterproof, anti-fungal polyethylene that is also coated inside. This provides a great barrier between the outside elements and the people inside the tent. The fabric used is 190T polyester that is laminated with PU 2,000mm. This is a great fabric that is quite tear resistant. As for the structure of the tent, it is important that it be up to the task since this is a very large tent. Americ Empire meets this demand thanks to their large steel poles. While this is technically an instant tent, set up time will be higher than most of the smaller instant tents that you have come across. This includes not only the setup and teardown of the tent but also storing it as well. Unlike some of the smaller instant tents that we have reviewed, this one will require a bit more storage space and won’t simply be able to be tucked away in a small bag while transporting to and from the campsite. However, there are plenty of great features to discuss. Probably our favorite feature is the inside dividing walls that can actually make this large tent into a 3 bedroom cabin. This will give family and friend much-needed privacy. And if you are simply looking for maximum sleep space, this tent is large enough to house 6 individual queen-sized mattresses. The bedrooms are split up thanks to 2-way zipper curtains. There are also outside windows that you can open to allow outside light and airflow in and can close at night for added privacy. There is also a mesh section that can be opened on top for additional airflow. Unfortunately, there is only one color choice that we have seen for the Americ Empire tent. It comes in blue with orange accents. And while we have nothing wrong with this color, we do wish that there were more to choose from. The styling of the tent is acceptable. It is a bit traditional compared to other more modern tents that we have reviewed. But we understand that when you are working with a tent of this size, your flexibility when it comes to design options is more limited. As you probably expect, the asking price for this large tent is on the high side. That being said, we still feel that it is a good value for a family looking for such a large storage area. You will end up spending a lot more buying 4+ individual tents to house the same number of people. And then you have to consider the added headache associated with storing, transporting, and setting up all of those additional tents. And since you want to spend the minimal amount of time setting up camp during your next outdoor adventure, we feel that spending a bit extra is worth it. The Americ Empire instant tent certainly isn’t for everybody. Someone who is limited on space, money, or simply does not need a tent that can sleep a dozen people will find better options with other brands. But for someone who is after a ton of storage space and doesn’t want to deal with multiple tents, this product is a great buy. Not to mention that the overall build quality is surprisingly good. Ayamaya camping tents actually come with 3 layers. The inner and outer layer are superimposed together to create a windproof barrier. The outer layer also doubles as a good bug barrier. The inner layer is made of 190T polyester cloth with a waterproof rating of PU1200. This makes it quite water resistant which you will be thankful for when you get caught up in a sudden rainstorm. Both layers also have UV protection to help protect you from the sun. We are really impressed with the clever features that you will find on an Ayamaya instant tent. On the smaller sizes, there are configurations that helpful both front and rear doors. This helps with airflow while also making entry and exit much easier, no matter what the orientation of the tent is. There are also storage pockets built into the tent for storing your valuables. On the roof, there is a lantern hang loop. The larger models step up their game even further by offering tons of windows and a huge entryway. There is even an extendable awning that can be put out to provide additional protection from rain and the sun. On the installation of these tents is a breeze thanks to the hydraulic system that is built into the frame. Simply pull it out of the bag and the tent will stand up on its own. Press the red expansion button, pull the back pole, and the tent is ready to go! And when you are done, it can be easily stored away. The color and layout will vary depending on which model you go with. But similar to other brands, the color options for a particular model seem to be limited to just one. If we had to pick, we really like the colors of the 3 and 4 person tents the most. 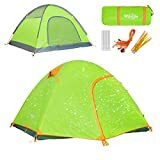 The bright blue and neon green accents look nice and also help to make sure that your tent stands out among the foliage. With the nice build quality and an impressive lineup of features, there had to be a negative to go with it. And that is with the price. While these aren’t the most expensive tents on the market, you will be a small premium for them due to their extra features and attention to detail. But in our opinion, the higher asking price is very fair because you are getting an excellent tent. 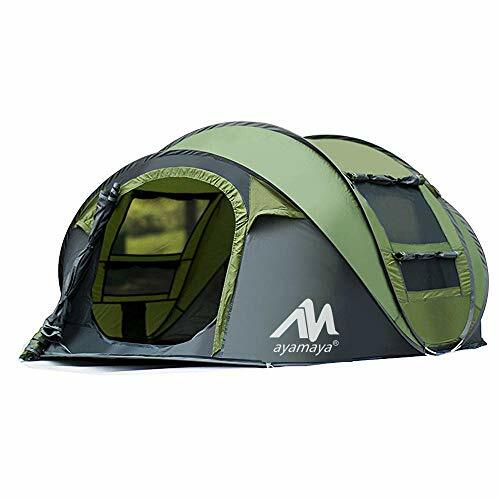 Ayamaya instant tents are a great addition to any campsite. Their tents come in a couple of sizes so a small or large family will have what they need. The build quality (particularly in the fabrics used) is quite good. And there are some really neat features that you won’t find on a lot of other models. In particular, we really like the hydraulic system that makes setting up and laying down the tent a breeze. Sure, you will pay a little extra but it is money well spent on what we consider to be an excellent lineup of instant tents. Due to the target market here, you won’t find some of the thick fabrics and high-end construction that more expensive adult-oriented tents have. And quite frankly, it really isn’t necessary. Bend River Baby Tents are designed for babies or small children to have a comfortable place to protect them from the outside elements. This can be great for a day at the beach or on the lake. Specifically, the fabric used is 210T polyester taffeta which is relatively strong. The layer of fabric also has a waterproofing agent applied to it. This layer doubles as a good barrier from the sun, being the equivalent to around UPF 50+. And we do appreciate that Bend River included metal pegs to help keep things supported and in the ground. We love how quick and easy these tents are to set up. They utilize a top-pull hub system which allows for complete set up in seconds. And once you count in anchoring the tent to the ground, you are only talking about a couple of minutes tops. Seeing how these tents are designed for children and babies, you want to be able to have easy access and views inside the tent. So both tents will come with large openings that are zippered. And for the baby tent model, there is also a mesh screen that protects your baby from insects. 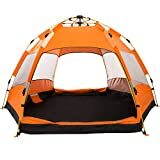 The larger kid instant tent has two connectable tunnel entrances, a detachable rain cover, breathable mesh on top, and Velcro straps to keep the flaps open. All in all, they are great tents and have many of the features that you would expect for tents oriented for kids and babies. The color schemes on Bend River tents are vivid. Remember: these are designed for kids. So while many adults probably wouldn’t appreciate the ostentatious colors, your kids will likely love it. You are limited in color selection, however. 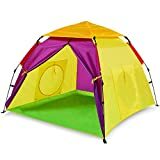 And the overall design is great for handling kids running in and out of it but it does subtract from the aesthetics that you might find in a normal “adult” tent. The asking prices for these tents are very reasonable. A big reason for this is due to how small they are. Since kids and babies aren’t as large as adults, they don’t require as big of a tent. And a smaller tent means less fabric and less structural support required. And these reductions in materials are passed on to you, the consumer. But just keep in mind that you will be limited in your applications with these tents. If you are after an instant tent made specifically for your kids and baby, then Bend Rivers instant tents should be right down your alley. Their design is perfect for your little ones and they have many of the features that you would expect to see. Plus, the asking prices are very competitive. But unless you are after those very specific requirements, then these tents won’t serve you much good. Bushnell instant tents ramp up the build quality to a higher level than many other brands that we have tested. There is a Weather Shield which takes advantage of thick fabric to help protect you from the extremes of Mother Nature. The fabric is water repellent and the corners are sealed off and waterproof. This makes the Bushnell instant tents great for outdoor areas that are likely to be exposed to sudden rain showers or even light snow. In addition, the structural frame is quite strong. And to keep things in place, heavy-duty tie-downs are included. Bushnell tents are all about maximizing toughness without sacrificing a lot in terms of usability. They utilize Heat Shield technology which has a special reflective coating directly on the underside of the rain layer. This helps to keep UV rays out and keep the temperature inside the tent down. The Instant Setup Technology also means that you can set up these tents in as little as 60 seconds. And this is even more impressive when you consider how large these tents really are! There are large mesh windows that allow for increased ventilation and also added visibility when unzipped. Inside and outside of the tents are pockets that greatly increase storage space. And the various tie-downs, zippers, and piping have a reflective tape on them to help easily identify them at night. The largest size actually has a whopping 7 windows in addition to a utility port for electrical cord access. And did we mention the size? These Bushnell Instant Tents can comfortably sleep up to 9 people! Despite being limited in color options (just one available), the overall styling of Bushnell Instant Tents is very attractive. The light tan/dark gray combo is spiced up a bit thanks to the orange accents. This is a very professional looking tent that will look great in any setting. However, we could always use a few more color choices. With the great build quality and a nice lineup of features, there has to be a compromise. And this comes in the form of cost. Bushnell Tents, while not extremely expensive, will be higher than many other models that you will see in this review. But it is important to remember just how large these instant tents are. You have enough room to comfortably sleep over a half dozen people without skipping on build quality. And that by itself more than justifies the asking price. If you are a larger group and after a proven and durable instant camper, Bushnell makes a strong choice. Their build quality has been proven out and there are enough features to make you feel right at home. We wouldn’t mind a few extra color choices and the asking price is higher than average, but these minor issues are easy to overlook when you think about the big picture. We are quite impressed with the build quality of Coleman Instant Tents. No matter which model you go with, you will find quality material used in all areas. We particularly like the double-thick Polyguard 2x fabric that is extremely tear resistant yet still allows for proper installation. For added resilience, the corners of the fabric are welded and have protected seams. And the zippers are also covered by fabric as an extra layer. Coleman states that their instant tents are water resistant. However, that is not the same thing as waterproof. And while very few instant tents can state that they are truly waterproof, Coleman is among the more water resistant ones that we have seen. In addition, you will enjoy a 1-year warranty on Coleman Instant Tents: and that is among the longer examples in the industry. Coleman tents are extremely easy to set up. Even the largest sizes usually only take around 60 seconds to 2 minutes. And speaking of sizes, these tents can be huge! For those with a large group, you can take advantage of Coleman’s excellent selection of extremely large tents. This includes 8 and 10 person tents. We also really like how easy it is to access and exit these tents. The larger tents come with large doors that multiple people can pass through at one time. Other notable features include a room divider to give added privacy, illumiline reflective guy lines for great visibility at night, ground ventilation, overhead awnings for protection from the rain when you unzip the door, access points for electrical cords, and plenty of windows that can be zipped open or closed. As is typical of nearly all instant tents that we have tested, you won’t find a lot of color choices available for a given model. 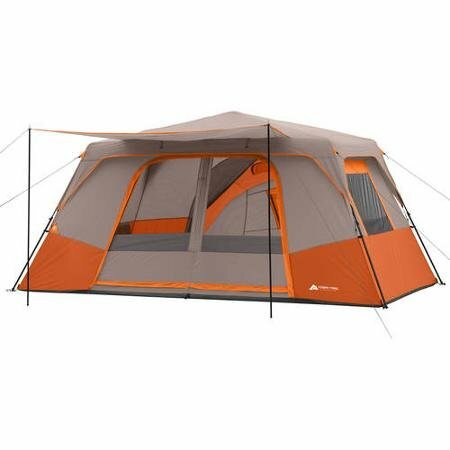 The redeeming quality of Coleman is that, due to their huge selection of tents, you will still enjoy a nice variety of colors (but they will require going with a different model). These colors include dark grays, neon greens, bright blues, oranges, dark blues, and more. And the way that Coleman has decided these tents with the various colors really struck a nice cord with us. These tents are modern while not being too flashy. And no matter if you are young or old, you will look great in a Coleman Instant Tent. The one major negative to discuss about these tents is their asking price. They do creep up in the price range due to their impressive build quality, nice features, and storied reputation. For someone on a tight camping budget, you may find that the prices are higher than you wanted to pay. However, it is important to remember that a tent is an investment. If you are able to use a tent that costs more but lasts 3x as long, it may end up being more frugal to spend a bit more money up front. And we feel that is certainly the case here. The lineup of Coleman Instant tents is huge and we really appreciate just how many different size options there are. No matter if you are a couple or a large family, Coleman will have a tent that meets your needs. The build quality of these tents is very good and there are enough features to make just about everybody happy. We also appreciate the modern yet timely styling. Yes, you will pay a bit more for a Coleman Tent but it is money well spent in our opinion. The build quality of Core Instant Tents is excellent. These tents utilize 68D Polyester which has a great history of being a tough fabric that is resistant to tears and scratches. The floor material is equally tough: 125gsm P.E. This material is very water resistant. What we really like about these tents are just how well they are put together. All of the various components are stitched together nicely. You can really tell that a lot of thought and engineering went into the design of these tents. Because of this, these instant tents should last for several years as long as you properly store them. There are some really cool features that we want to discuss. First off, the setup on these is incredibly simple. Even the largest sizes should be ready to go in 2 minutes or less. These tents are also quite tall (80+ inches in many cases) so even the tallest of campers should have plenty of headroom. The h2o block fabric coats all of the outside pieces and keeps you safe from the elements. And speaking of elements, the adjustable ventilation system allows for fine adjustments to how much air you allow in (which can be helpful in those hot summer months). We also really like the separate front screen with bug wall that is on the outside of the front entrance. This gives you an “outdoor” area while still being protected from the critters of the night. You will also find hanging storage pockets for storing your items, room dividers, and multiple windows. But probably our favorite feature is the lighted tent option. Certain models of Core Instant Tents actually have built-in LED lighting. These lights are built directly into the ceiling poles and provide much-needed night during the evenings. Depending on which size and model you go with, you will have 3 or 4 different color options. They include neon green, blue, orange, and various shades of gray. In terms of the styling, these are super modern instant tents. We think that the overall aesthetic is fantastic. The way that the bright oranges and greens are complemented by the more subtle grays really works. And the various features such as the bug shields and awnings are very cleverly incorporated into the overall design without making things feel cluttered. As you can tell, you get a lot when you buy a Core Instant Tent. But it does also mean that the asking price is higher than you have seen from other brands. But overall, we feel that when you look at the “big picture”: features, build quality, styling, etc., the price is more than fair. Core Instant Tents are certainly at the top of our list for the best instant tents that money can buy. There are many great features (many of which you won’t find in many other tents) and the build quality is excellent. We also really like the design of these (your tent will definitely stand out from the crowd at the lake or park). Sure, you will pay a bit more for a Core Instant Tent but it is money well spent. The overall build quality of Easthills Outdoors Instant Tents is pretty good. The tent’s fabric is comprised of 150d Oxford Fabric Tub. And to hold this fabric together, you will find corner welds, taped steam, and covered zippers. This means that you can put this tent through the elements without worry of it falling apart. The added benefit is that the fabric is quite water resistant so if you happen to find yourself caught in a rainstorm, you should still be able to stay dry. 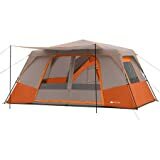 There is also a 1-year warranty on these tents which is better than you will get from most other companies. And it shows us that Easthills Outdoors will stand behind their products. We are impressed with how well-designed these tents are. If you happen to go with one of Easthill Outdoor’s beach tents, then you will find specific features that help to make it right at home on the beach. These include a huge overhead area for protecting you from the sun and have room for your beach chairs. 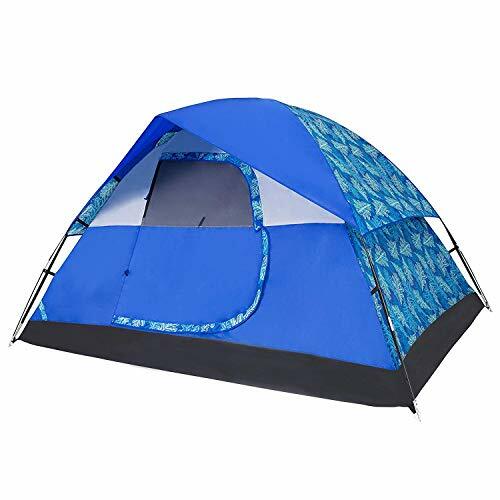 Since the beach can be quite windy, you have the ability to peg all 4 corners and reinforce the tent thanks to extra pegs and guylines that are included with the tent. And for added privacy while changing or taking a nap, the front opening can be zippered up. And since beaches tend to have sand, there is a pocket at the base of the tent that allows you to easily remove any sand has found its way inside. As for the camping tents, we really like the smart assembly mechanism. It allows you to set up and tear down the tent in a matter of minutes. And there is plenty of ventilation: top vents, 2-layer mesh, multiple windows, and the door. So when you need to circulate air it is very easy. And for those times that you want to avoid air circulation, simply zip up these various openings. We also really like the huge overhead awning that can be extended from the front entrance and adjusted as necessary. And when it is time to go home, simply fold up these instant tents and pack them away in the included carrying bag. These are extremely modern instant tents. They utilize a simple, modular approach that will certainly make them stand out from your grandfather’s old tent. The color schemes include blue, light blue, and tan. We find them all to be quite attractive. The one thing that people may not enjoy about them is that they do give off the appearance of being flimsy. 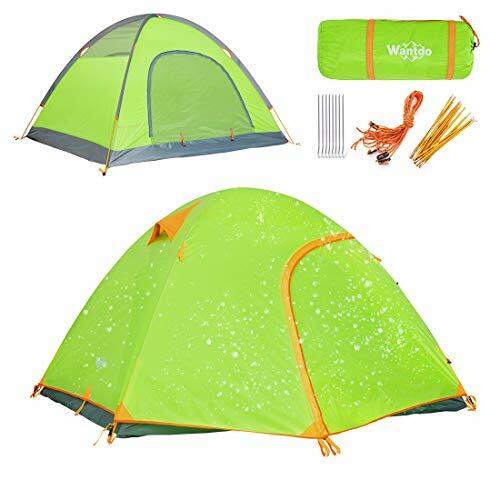 However, with proper anchoring, they are just as capable as any of the larger and thicker tents that you will see in this Ultimate Guide. Asking prices are about middle of the road. It is important to remember that several of these tents really aren’t full tents in the sense. Rather, they are more like temporary shelters from the sun or rain. So while you may see some price savings when looking at Easthills Outdoor Tents compared to other brands, but sure that what you are looking at will actually meet your needs. 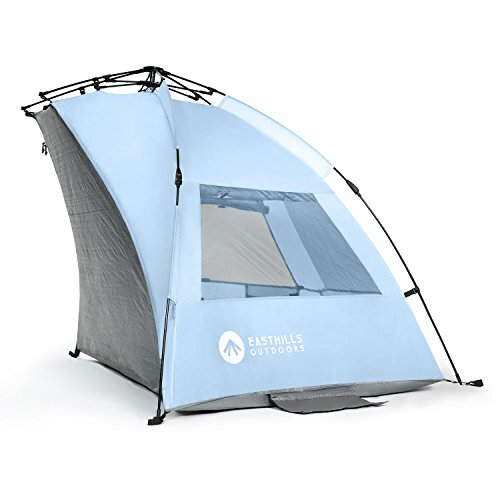 Easthills Outdoors Instant Tents address a very specific niche: people who need short-term protection from the sun or rain. This makes them great for a day at the beach or for camping. However, their selection of long-term tents is much smaller. Still, we can’t deny that what they are doing is working. The build quality is great and, while the design is simple, there are enough features to make most people happy. The structure of most of these tents is fiberglass. While it is much more lightweight than most metals, it also isn’t quite as resilient. The fiberglass can be prone to cracking or completely breaking when bent too far so extra care needs to be taken while transporting and storing these tents. The outer fabric is made of 100% polyester mesh with 1,200 holes per inch. This is a happy balance between strength and breathability. And the polyester is pretty water resistant (although not fully waterproof). Being low-cost tents, EasyGo instant tents are pretty Spartan in their feature lineup. The most notable features include included guy lines and good breathability. But noticeably missing from these tents are lots of storage space, external awnings, and room dividers. There also aren’t as many windows as we have seen in other tents. For someone who is simply looking for somewhere to sleep at night, these tents will do fine. But for someone who prefers a few more creatures comforts, you may come away a bit underwhelmed. Styling is simple and safe. Depending on which model you go with, you will have a color selection of red or various shades of blue. These tents don’t quite “pop” as we have seen in other brands. But for a lot of people, that really isn’t a huge deal. The biggest selling point of EasyGO instant tents is their price point. They are extremely affordable. 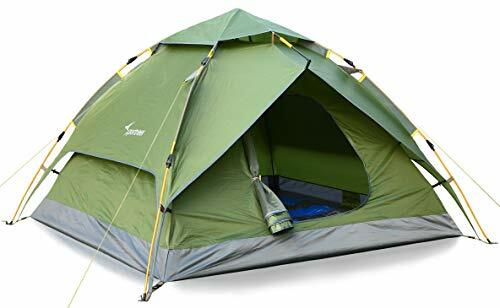 However, this does come at the sacrifice of using higher-end materials, limiting how many features you have, and also having an overall smaller tent. For someone who is after a simple, low-cost tent for 1 to 4 people to sleep in, these tents will work fine. But don’t expect them to last as long as some of the more expensive and larger tents that we have tested. Also, you will be underwhelmed by the number of features that EasyGo offers. But we must commend them on being clever in their design and targeting specific niches such as spray tan booths. As is pretty standard of many of the instant tents that we have reviewed, Hewolf’s tents are made of 190T polyester cloth. This is a very water resistant material with a waterproof rating of PU20000. This material has the added benefit of being pretty UV protectant. The frame used is a bit flimsy but since the fabric and overall structure of the tent aren’t too extreme, it seems to do the job. Hewolf tents are all about efficiency. We really like the 2-door feature on their 3-4 person tent. It consists of doors on opposite sides of the tent. Not only does it allow for quick and easy access by having an “entrance” and an “exit” door, but it also means that you will have plenty of air circulation since the doors act as a sort of wind tunnel. You will also find an anti-bug layer that allows for air to get in but bugs to stay out. Inside there is a lamp hook and the roof is pretty high thanks to the sharper dome design that this tent has compared to many other models. These tents are pretty simple in design. But what makes them really stand out are the colors. The multi-color schemes that Hewolf use really look nice and give these tents a “professional” look. You can choose between a really cool tan/gray combo or the more eye-catching neon blue/green combo. Both look awesome and will stand out at your next campsite visit. Asking prices for these tents are more than fair. They are rather small and the build quality is nothing groundbreaking but the price point is very attractive. Anybody after a smaller tent should definitely consider this brand from a cost standpoint alone. While Hewolf doesn’t bring anything to the table that we haven’t seen multiple times before, their simple and affordable tents check all of the major boxes. If you are wanting a small and simple place to sleep for the next few camping seasons, this lineup of instant tents should work just fine. Build quality of the Lightspeed Outdoors tents is about average. The fabric used is comprised of 2000mm PU coated poly oxford material. This is plenty of tough material that is quite tear resistant. The poles are 9.5mm fiberglass. While we always prefer some sort of quality steel, the fiberglass does work OK since this isn’t a very large or heavy tent. And we do like that Lightspeed Outdoors stands behind their tent with a 1-year warranty. The name of the game here is simplicity and speed. Lightspeed Outdoors Tents are designed to be set up extremely quickly. The simple shape and design allow for this. As for creature-comfort features, you will get to enjoy a bathtub style floor that is shaped in a way that keeps dampness out. And to further help with fighting off wet conditions, the material is relatively waterproof. There is a back window that can be opened or closed for added ventilation. And for storing, you can open the extended vestibule. Outside of these things, however, there aren’t a lot of other features to talk about. Again, this is a very simple tent and loaded it up with features wasn’t a top priority it seems. The styling is simple, safe, and nothing that you haven’t seen before. It comes in a light blue/gray color combination. While it looks nice, people who prefer colors other than blue will be disappointed. And the simplicity of this tent doesn’t really make it stand out from the crowd. That might or might not be a big deal to you. Considering the performance and features, the asking price is a bit higher than we would like to see. There is nothing inherently wrong with this instant tent but there are other tents that are very similar that are more affordable. Lightspeed Outdoors seems to focus more on canopies and cabanas instead of livable tents. But they do branch out into this realm with their 4-person Mammoth tent. This tent doesn’t do anything wrong but it doesn’t really wow us, either. You will find that it has pretty standard build quality, a short list of features, and only one color to choose from. This isn’t a terrible choice but there are better options out there. Both models of Night Cat Instant Tents utilize 210D oxford fabric for the material on the walls. This works in conjunction with the 120G waterproof and abrasion-proof PE fabric on the bottom of the tent. This fabric is quite tough and should be able to handle the typical elements that Mother Nature will throw your way. What we also really like about the 4 to 6 person tent is that it also takes advantage of steel poles. 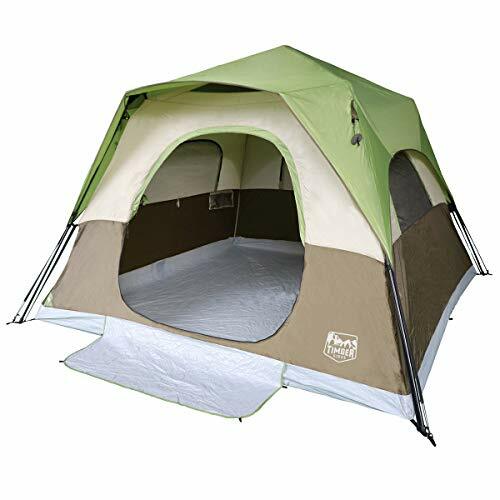 The smaller 2 to 3 person tent has fiberglass poles but, due to its smaller size, that is still acceptable. The warranty offered is just 6 months long, however. This is shorter than many of the other brands that we have tested. 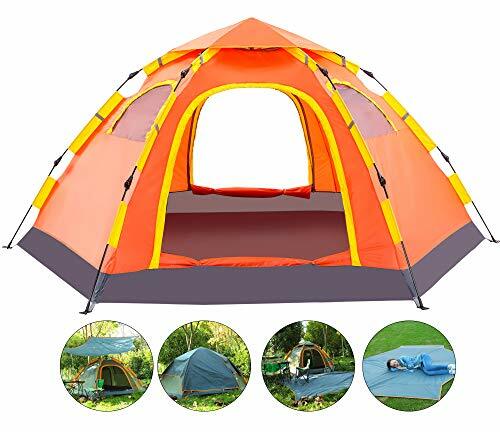 There is an advanced hydraulic pressure mechanism that makes setting up the 2 to 3 person tent a fast task. The larger tent is a bit more time consuming but given the size, it is still among the fastest tents that we have tested in regards to setting up and taking down. These instant tents are very roomy. They offer high ceilings and plenty of room to both stand and sleep. On the back side of the tent is a flap that can be opened and closed for extra circulation or used as a second door. And you will also find a bug screen that can be opened and closed. 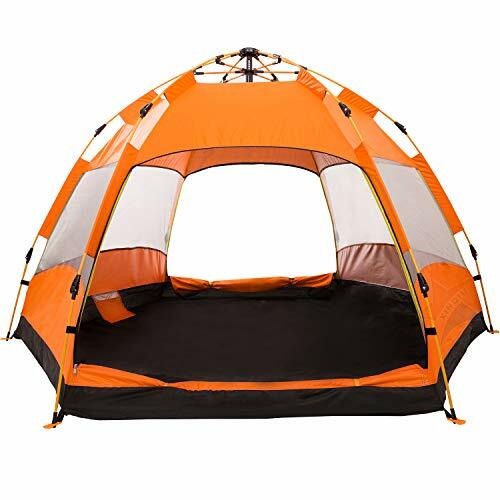 With the larger 4-6 person tent, the door can be treated as a porch. You can lift up the front flap and mount poles underneath it, creating a very welcoming front porch area. There are also tons of windows with vents (and that can also be closed when you would prefer more privacy. The only issue that we have with the larger model is that there isn’t any sort of internal barrier that breaks up the sleeping space into rooms. The overall shape and styling of Night Cat Instant Tents are pretty normal. But where they do stand out some from the competition is that they actually offer multiple color choices. In the larger model, you can choose between blue and green. And in the smaller model, your choices are two different colors of green in addition to a blue. The prices for these instant tents is fair. They fall about the middle of the range. When you take into account the quality of the materials, the list of features, and the amount of living space, the asking prices are quite reasonable. Night Cat Instant Tents bring to the table a couple of solid competitors in the medium to large tent market. Both models promise super-fast setup and teardown while still have lots of living space inside. And the build quality is more than capable of all but the most demanding outdoor conditions. We also like that you actually have multiple color options to pick from. All in all, we are quite impressed with this brand. When you are dealing with tents of these sizes, it is important to have a strong foundation and durable fabric. And Ozark Trail certainly has that here. The tough polyester shell is very strong and can handle outdoor settings without falling apart. And the frames used are equally tough: strong, thick metal poles that provide the necessary support. Since many of Ozark Trail’s tents are on the larger side, they are more prone to being affected by wind since their surface area is larger. With all of the included anchoring and poles, you should have no problem getting this tent supported and stable. As you might expect, the specific features that you will enjoy will depend on which model you go with. The larger Ozark Trail models have a laundry list of great features. The design of them allows for an impressive 84 inches of height. This means that even your tallest friends and family members should have no problem walking around comfortably. There are also sewn-in room dividers to give these tents a more “homelike” feel by providing privacy when necessary. There are plenty of internal pocket organizers for storing items in. And there are electrical access ports to help bring a bit of civilization in. No matter which size you go with, you will find lots of windows. Anywhere from 4 to 6 windows is common. And on these windows will have a mesh that protects you from bugs. The front door can also be pulled out and lifted up. This creates an awning and a sort of porch. Finally, most models with come with small vents on the roof that provide additional air circulation at night. For a specific size of Ozark Trail Instant Tent, you will have either one or two color options to pick from. The most common ones being gray, orange, and green. As for actual styling, we found these tents to be very modern and attractive. They all follow a pretty similar design approach. And this approach really works in the larger models. Thanks to the angled roof and rectangular design, they really will remind you of a small home away from home. A big reason that Ozark Trail has become so popular is their great pricing. And that is also the case here. These are very competitively priced instant tents. You will really notice this in their largest models. For what other brands are charging for an 8-person tent, Ozark Trail will be charging for a 12 or 14-person tent. 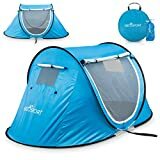 This is really helpful for large families who are on a budget but still want to have a suitable tent for their big family. We really have nothing negative to say about Ozark Trail’s Instant Tents. There are a plethora of sizes to choose from. No matter if you are a solo traveler or want to go out to the lake or mountain with a huge group, Ozark Trail has a tent that will work. And for the price, the build quality is excellent. Another great aspect is the impressive list of features. This is good for those who still enjoy a bit of creature comfort while “roughing it”. If you are shopping around for a new instant tent, definitely check out Ozark Trail. 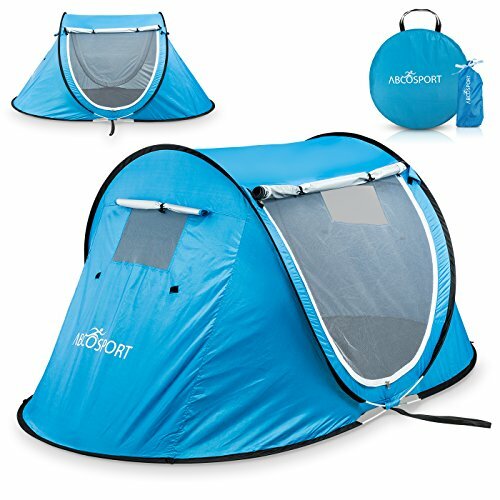 According to Sportneer, their instant tent is leakproof thanks to quality fabrics used on the outside of it. However, we question this statement. In our experience, this tent does tend to leak during moderate to heavy rain. However, the base of it seems to do a good job of repelling moisture from the ground. The frame of it is fiberglass. And while there is nothing inherently wrong with using fiberglass over metal, the poles here are a bit on the thin and flimsy side. This can make them prone to being affected by high winds. This is a pretty straightforward tent so there aren’t a ton of features to discuss. The door is plenty wide and comes with a decent zipper to allow you to easily open and close it. Probably our favorite thing about the Sportneer Instant Tent is how quick it is to set up. The hydraulic lift system is very intuitive. You can also unzip the base of the tent, fully exposing the walls to the outside world. This can be good for when you are on the beach and wanting more of a cabana than a full-fledged tent. The styling of this product is nothing that we haven’t seen before. It is a safe, symmetrical design. While there is nothing wrong with it, we do like brands that make more unique designs to stand out. Also, you only have one color to choose from: green. You will sacrifice some in the way of size and features with the Sportneer Instant Tent. But you are rewarded with an extremely low-cost product. If you happen to be on a tight budget and are only looking for something simple for 1 to 3 people, then this can do. But for everyone else, you are likely going to want to spend a bit more money and get a more capable camping tent. The Sportneer Instant Tent is a simple, low-cost product. It doesn’t do anything terribly, but not qualities of it really stand out, either. The materials and construction are only average so if you are planning on really experiencing the extremes of Mother Nature then this tent may struggle. But for a casual weekend on the shores of the lake for you and your loved one? Sure, this can handle that. The Teton Sports Instant Tent is extremely durable. It comes with taffeta and micro mesh inner, making it very waterproof and able to hold up to high winds. The frame is a bit thin but seeing how this is a single person tent, it does the job fine. We are impressed by the way that the frame is designed. It creates a sort of “backbone” that runs along the length of the tent. This makes it quite sturdy. Obviously being a single person tent, you will be quite limited in how many features you can cram into such a small space. Because of that, many of the features you are used to seeing on larger tents won’t be found here. However, that didn’t stop Teton Sports from finding some clever ways to make it more user-friendly. There is a full mesh top that can be removed to allow for a rooftop view. This is great for stargazing at night or providing more natural lighting during the day. There is also an optional stand (sold separately) that will elevate the tent off of the ground. As for setting up and taking down, this is one of the fastest and simplest instant tents that we have come across. It pops up nearly instantly with a pull of the drawstring. And conversely, it can be taken down almost as fast. The big hurdle will be for those who want a larger tent that can sleep more than one. If you happen to be one of those people, then this tent won’t be for you. Also, the ceiling is very low so you won’t be able to stand up in it. 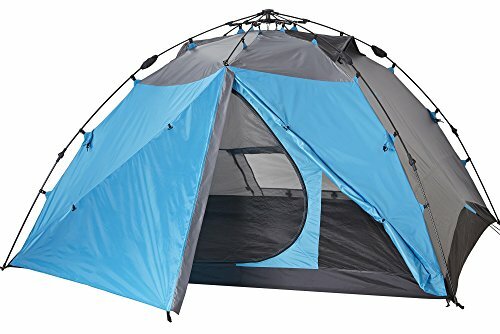 Since this is a one-person tent, the design is really unique. It resembles some advanced pod from the future more than a traditional tent in a style that you are used to. And for colors, you can pick from one: yellow. Quite frankly, the bright yellow will probably be a turn off to some people who don’t want something so flashy. But the bright color can prove to be helpful in easily identifying where you set up your tent while out in the woods. Since you do get a bump up in build quality and performance with Teton Sports tents, this tent will be a bit higher in price for the size. Other tent companies will offer tents at similar price points but they can sleep 3 or 4 people. That being said, it is still reasonably affordable and won’t break the bank for most people. 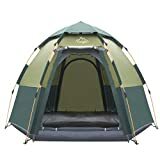 The Teton Sports Instant Tent is very unique. It is designed for a specific application: solo campers. This will make it an instant no for many people who need a larger tent. But if you happen to be in the small sector that is looking for this type of product, this is a good one to have. The build quality is very impressive and the convenience of it is equally on point. The build quality on all Timber Ridge tents that we have come across is quite impressive. The fabric is made of heavy-duty polyester and the floor is comprised of 1000D polyester. This is very tear-resistant fabric. The frame is equally robust. It is made of thick aluminum. We love brands that use aluminum due to its impressive strength while still being very lightweight. Being a larger series of tents, Timber Ridge was able to incorporate lots of windows into their two instant tents. You will find two rollup side windows. This means that you can keep them down at night for added privacy and then roll them up during the day for natural light and more air flow. There is also a rear ventilation port. On the roof are two vents that can be shut from inside to seal in warmth or opened for even more ventilation. There is an overhand awning above the entrance that allows for you to be able to open the door without having rain and other things fall directly on top of you. Another great feature is the electrical port that allows for you to run an electrical cord inside the tent. Finally, there are both internal storage pockets and guyline storage pockets. Set up time is a bit slower than in other instant tents that we have tried but that can partially be attributed to the size of the tents. We are so-so about the styling used on Timber Ridge Instant Tents. These are very “safe” tents when it comes to their design. Nothing really stands out compared to the many other tents that we have reviewed. However, we will say that when you examine a Timber Ridge tent close up, it does give off a sense of quality. All of the stitching and attachment points look very well made. There are also a few different colors to pick from depending on which model you go with. The price point of these tents is a bit above average. You do get superior construction and higher-end materials for that higher asking price, however. And it is also important to remember that these tents are quite large: capable of sleeping 6 or more people in many cases. When you consider their capabilities and features, the asking price doesn’t seem quite so bad. We are content with how well Timber Ridge’s Instant Tents performed in our review. The build quality and materials that they use are among the best in the industry. And while they do take a little longer to set up, they are very sturdy once they are set up. And there is plenty of sleeping space for you and your fellow campers inside. That being said, you will have to pay a bit extra for one. Build quality of Toogh Instant Tents is pretty good. The fabric used is 210D oxford fabric that is then coated in silicone. This silicone provides a waterproof barrier with a rating of 3000mm. On the floor of the tent, you will find 210T fabric with a similar silicone coating. This bumps the waterproof rating up to an impressive 5000mm. The structure is held together thanks to fiberglass poles. But the secret weapon in Toogh’s ability to handle outdoor environments (specifically as it relates to wind) is thanks to its symmetrical design. This tent is quite streamlined and very symmetrical. This allows the wind shear to be distributed very evenly over the face of the tent. And it really comes in handy when you are experiencing windy conditions. There is also a 12-month warranty which is quite nice. In terms of setting up, the Toogh Tent is a breeze. You can have it up and ready to go in around 60 seconds. All it takes is lifting up the top and pressing the ends of the poles. As for features, these tents are about average. The most notable features include a mosquito net that can be draped over the front entrance, 2 different doors, and mesh windows that can be opened for added air circulation. We do wish that there was a bit more of an overhang above the entrance. It would also be nice to have more in the way of storage pockets and perhaps an opening to run a power cord. The shape and styling of Toogh Instant Tents are very simple. However, where they stand out is in their color selection. This brand has one of the largest selections of colors that we have ever come across! This includes colors such as green, blue, orange, tan, and plenty of multi-color schemes as well. There are quite a few that we found to be very appealing to the eyes. One of the biggest factors that allow Toogh to enjoy the success that it has is its asking price. Considering the build quality and the appropriate size, these tents are very affordable. Even those on a very tight budget should be able to swing them. You may not have quite the sleeping/standing room or feature lineup as some of the more expensive tents that we have tested, but the cost savings are significant. Toogh Instant Tents are a solid contributor to the competitive pop-up tent world. While they may lack some in product size selections, they make up for it in color options. And the tents that they do have available are simple and durable. They really shine in windy conditions thanks to their symmetrical design. And did we mention the great price? These tents are a solid purchase in our opinion. The fabric used on Qwest’s Instant Tent is a 190T Nylon. We have had good experiences with this particular type of material in other tents. However, it is a bit on the thin side here which affects its waterproofness as well as its ability to handle high gusts of wind. We have read reports of this tent falling apart on people in the middle of a rain shower, drenching them. The fiberglass poles are also a bit on the thin side and just don’t hold up to a lot of strain. This tent sleeps 4 to 6 people so it is a bit on the larger side. However, we wouldn’t actually recommend 6 people try sleeping in this tent because things would become quite cramped. One big positive is just how quickly you can set up and take the Qwest tent down. We are talking in a minute flat. But there just aren’t a lot of features worth getting excited about here. There is an included rain cover which is nice. But outside of that, we noticed that it is missing much in the way of storage and it doesn’t even come with windows that can open and close. This really is a bare-bones model. 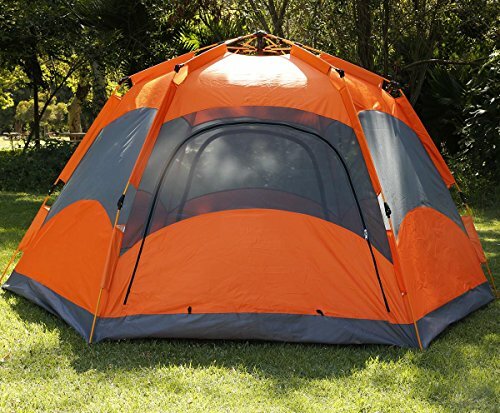 While we like the paint job on this tent, there is just the one to choose from (orange). And the overall fit and finish of this tent is lacking when you look at it. The combination of limited color choices and a not very “robust” appearance definitely knocks off a couple of points. Easily the biggest selling point of the Qwest Pop-Up tent is its price. 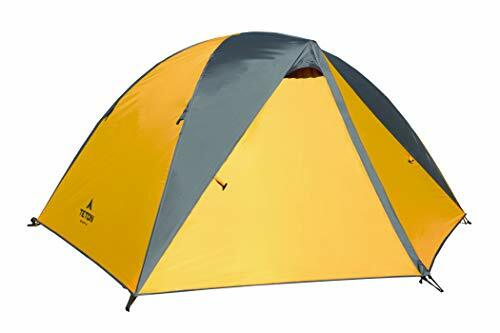 For the size, it is among the most affordable tents that you will find. But there are just too many sacrifices that have to be made in the way of build quality and features. And any money that you save on this tent would end up being negated when you had to buy another new tent the following season. While we must commend Qwest on its fantastic asking price, there are too many flaws in the material selection and design of their 4 to 6 person instant tent to make it a strong buy in our book. The lack of features and lack of color choices are additional concerns. In this case, we feel that you may be better off spending a bit more for a product that will make you happier in the long run. Depending on which URPRO model you go with, you will enjoy either 190T or 210T PU fabric. This fabric is specially designed for outdoor applications as it is much more tear-resistant than other fabrics. The more expensive 3 to 4 tent model also promises a water resistance coefficient of 2000 to 3000mm. While the smaller model doesn’t offer such a guarantee. And while these certainly aren’t the toughest instant tents that we have ever seen, they aren’t half bad considering the price. The frame is a bit thin but on tents of this size, it does the trick. Another area that you will be reminded that this is a low-cost tent is in the features. There really aren’t many to mention. The biggest benefit of a URPRO instant tent is that it is very small and lightweight. This makes transporting it very simple. A single person will also have no problem setting up and taking down this tent. But beyond there, you will be quite underwhelmed by what it has to offer. First off, they are extremely small. Even the larger 3 to 4 person tent will be extremely cramped if you try to actually fit 4 people in it. In addition, there is essentially no storage outside of a small pocket inside. There is a small opening on the roof to allow air to circulate but we feel that it isn’t enough if you live in a warm climate. If we had to choose, we feel that the larger 3-4 person tent is much more attractive both in color and build quality. This is no surprise as it is the more expensive of the two models that we are reviewing. But neither of the URPRO pop-up tents emits a feeling of being a premium model. These are low-cost examples and you will be reminded of that every time you look at them. Now for the good news. If you are on a bare-bones budget and only want to spend that absolute minimal amount, then URPRO can hit a price point that only a handful of other brands come close to. These are extremely affordable camping tents. But as you can clearly see in the rating metrics that have already been discussed, that does come with some pretty big sacrifices in build quality and features. URPRO is another example of a low price brand that seems to focus a bit too much on being affordable not enough focus on making a quality product. Their tents may last for a season or two but the subpar build quality, very limited features, and small size will likely take its toll on you. If you are a small person and prefer solo camping (or maybe camping with one other person) and value saving as much money as possible then these tents may work. Otherwise, spend a bit extra for a nicer product. As is pretty standard with these ultra-low-cost tents, there are some shortcomings in build quality. The standard 190T polyester is used on the outside (the larger model comes equipped with 210T). It provides UV50+ protection. And while not fully waterproof, these tents should keep you dry in the event of a light rain shower. But if you find yourself in a deluge or a severe thunderstorm, these tents may not be up to the task. There aren’t many features to discuss. The best feature is the portability. These tents are small, lightweight, and easy to set up and take down. The larger of the two tents, the Wantdo 2-3 person model, leads the way in creature comfort features. There are two inner mesh pockets for storing items, two doors that help with both mobility as well as air circulation, an inner mesh layer for keeping out bugs, and a handy carrying bag. The smaller model also has dual doors but does sacrifice some in the way of air ventilation. All of the color options that we have seen on Wantdo pop-up tents are very bright. These include a sky blue and a neon green color for the larger model and a more teal green in the 2-person model. If you are someone who prefers more subdued coloring, then you will likely not really enjoy these colors. The main benefit of such bright colors is that your tent is easy to identify while hidden among the trees and brush out in the woods. We really like the price point that Wantdo has managed to achieve with their small selection of tents. These are by definition budget tents. And they do give up some in the way of durability and overall space to achieve such a price. But considering just how affordable they are, their selection of features and expected life really isn’t that bad. When it comes to a low-cost pop-up tent, Wantdo brings a solid competitor to the list. These tents obviously have their flaws: they are limited in space, have some so-so build quality, and average (at best) features. But they manage to still make a functioning tent at a very reasonable price point. Wnnideo is aiming to offer larger tents that still fall into the budget price category. The only way to really achieve this is to make sacrifices in other areas. And this can include build quality. When we were going into this review, we were expecting Wnnideo Instant Tents to be very cheaply built. But to our surprise, they are actually quite nice! They are constructed of 210T Polyester which has a 3000mm waterproof rating. And being on the larger side, their frame also enjoys a much-needed upgrade. They still go with fiberglass instead of metal, but the design with intertwined poles makes for a very strong tent that can hold up to the typical wind. 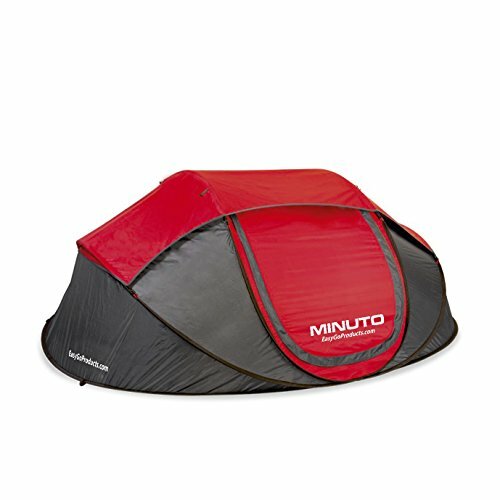 There are some really clever features on Wnnideo Tents that we don’t see a lot of other brands do. These tents are all about convenience. They offer huge entryways and the doors can actually be lifted off the ground to form an awning above the doors. And inside, there are optional walls that can be put up to make some of their tents into 2-bedroom tents. Another one of their models has an optional extending entrance that forms a sort of tunnel and provides additional storage space. The only problem with these unique designs is that they take a bit longer to set up and take down. And it also adds to the overall weight and dimensions of the tent when it is collapsed and in transport. There is also surprisingly little storage space inside for how large some of these tents are. The tents themselves come in some really clever designs that instantly make them stand out from much of the “norm” that other brands are going with. There are also multiple colors to choose from (but as of late it appears that many of the colors are hard to source). And the fit and finish both inside and out are quite good considering the price point. Given the large stature of these tents, decent construction, and clever features, the asking prices are more than fair. You will pay a bit higher but that is mostly due to being a larger tent that simply requires more fabric to make. But if you are a large group that is after a suitable tent, the cost of these shouldn’t alarm you. We came away quite impressed with what Wnnideo has to offer in their lineup of instant tents. They have some very clever designs and place heavy emphasis on medium to large tents. This means that they are much better suited for larger groups or families. And they are able to keep their products at a reasonable price while still being of an acceptable level of quality. It will take a bit more time to set these tents up but that is a small complaint that is easily overshadowed by the positives. This is a very simple tent. The outside is made of 170T polyester and the base is made of 210D oxford fabric. The oxford fabric is quite water resistant. The 170T isn’t quite as water resistant but should keep you dry during light showers. But anything heavier than that and you may be in trouble. 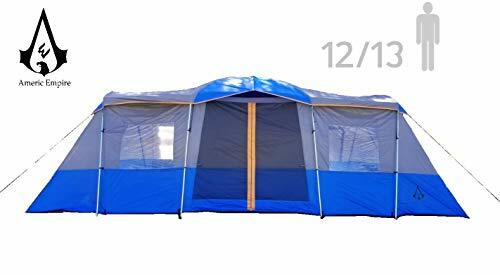 This tent is pretty unique in its design and part of that design is not having much supports across the top. This makes it easy to set up but it does sacrifice some rigidity when it is windy. And the frame itself is also on the thin side. This tent certainly does stand out from most other instant tents that we have reviewed. And this is because of the unique design that Xinqiu implemented. Another nice selling point is the color choices. There are actually 5 different color options that we have come across. This is much more than many of the other instant tents that we have checked out. This pop-up tent is priced at an OK range. While it may seem pretty affordable at first glance, it is important to remember that this is a very small tent. And that the frame is designed in a way to be easy to use but that sacrifices some rigidity in the process. We are content with the Xinqiu instant tent. It is small, portable, and extremely easy to set up and use. There are also enough features to make us happy. But it is very limited in its scope. It is rather small and flimsy and won’t be a good selection in areas that receive a lot of rain or high winds. But if you are a solo hiker or have you and a partner and looking for something simple, this could work. The build quality will vary a bit depending on which specific Zenph Instant Tent model that you go with, but they are all pretty good. You can choose between fabrics such as 190T, 185T, and 210D polyester. All of these fabrics have been proven to be quite resilient. They are also pretty waterproof. Waterproof ratings will be around 2000m on the external fabric and up to 3000m at the base. For those that need something more capable, Zenph also has a higher-end model with 5,000 Pu Oxford cloth and that is capable of handling level 7 winds. This makes it a good choice for environments that experience higher levels of rain and wind. It appears that Zenph focused more on build quality than adding a ton of features. 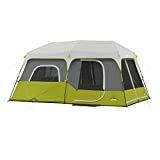 The features worth mentioning include side vents for added air circulation, an easy open door, and b3 gauze on the ventilation outlets to keep mosquitos and other bugs at bay. These tents also have the added bonus of being extremely quick to set up. In fact, one of Zenph’s tents can be set up in approximately 3 seconds! Our only minor complaint is that these tents all lean on the smaller side and could use a bit more storage space. An electrical cord hole wouldn’t hurt, either. We really like the styling of every Zenpth pop-up tent that we have seen. They all come in really cool, bright colors. They also have really progressive curves thanks to clever ways that the fabric pieces were attached. These tents look like they are ready for this day and age. We wouldn’t mind there being more colors available for a given model, however. You will pay a bit extra for a Zenph Instant Tent. But you will also notice a clear bump in build quality. These tents are designed to last. By using higher end materials and more advanced manufacturing processes, the tents cost a bit more to make. And as you might expect, these costs were passed on to you, the consumer. But while you may spend a bit more, we feel that it is justified. We are quite impressed with Zenph’s lineup of tents. They are all very well made and take advantage of features and fabrics that not a lot of other brands can say that they use. But these tents won’t be for everybody. They are somewhat bare-bones and also on the smaller side. In addition, they cost a bit more than some of the ultra-budget models that we have discussed. But for someone who plans on being in more demanding environments, this is the type of tent that you should be looking for.